Today, Chinese automakers produce world-class knockoffs of Western car brands. 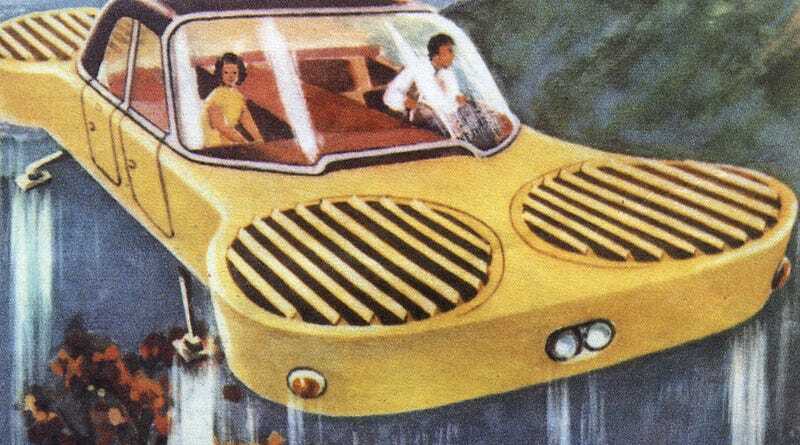 But back in the early 1960s, it was the imaginary cars of the future that China was knocking off. The Hong Kong Polytechnic University is home to the image above, depicting a sleek flying car of the future which appeared on the 1961 cover of a Chinese magazine (roughly translated as Public Science or Popular Science). If it looks familiar, that's probably because it's a direct rip-off of an iconic issue of Popular Mechanics from 1957. It was even used as the cover for the Popular Mechanics book The Wonderful Future That Never Was by Gregory Benford. While the Americans and Soviets were kicking off the Space Race in the late 1950s and early 1960s, China was hoping to modernize its economy. Mao Zedong's Great Leap Forward was supposed to catapult China from a largely agrarian economy into an industrial powerhouse on the international stage. Mao's version of Communism was intended to make China anew and usher in an era of wealth and prosperity for everybody. This paradise, it seems, even included the flying cars more commonly associated with American and Soviet space age futurism. Instead, of course, corruption, mismanagement and oppression led to the starvation deaths of anywhere from 20 to 45 million people.